The captains of each company were presented with swords and Company flags as the time of departure drew near. Capt. Harry Fay of Company H was presented with a beautiful sword from the people of Potsdam on January 10 . and the citizens of Stockholm gave a Company flag to Capt. 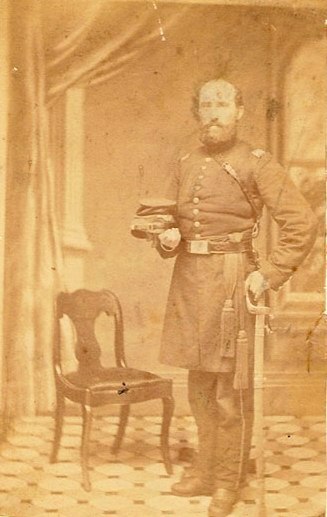 Orange Newton of Company F.
Capt. Charles Knowles of Company D received a sword on January 14 from Mr. Bicknell of his law firm. The same day, a sword was presented to Lt. Royal J. Whitney of Company D by the citizens of Philadelphia, and a flag by the ladies of Louisville and Waddington. According to the Courier & Freeman, "the most splendid affair of the day was the Regimental flag presented by T. S. Clarkson Sr. on behalf of his daughters. It was dark blue, full size and seamless. It was beautifully painted, bearing on its broad folds the State and Union arms in the center, over which is the inscription "92nd Regiment, New York State Volunteers." with the motto Deo Fidendium, the whole lettering being in gold. It was mounted on an elegant standard surmounted with a silver spear, the whole forming a Regimental flag excelled by none". About this time, a furor arose over over Lt. Col. Bingham, the second-in-command of the Regiment. He was from the mid-west and had been assigned to the Regiment by Gov. Morgan. The people of Potsdam had welcomed him in a most friendly, hospitable manner, inviting him into their homes and entertaining him royally. The week that the swords were presented to the officers of the Regiment, a bay stallion was presented to Col. Bingham by Dr. Bates on behalf of the people of Potsdam and the Regiment. It was learned shortly thereafter that the Colonel had purchased the horse himself and arranged to have it look like friends had rendered him a great honor by presenting him with this gift. When the people of Potsdam realized the duplicity involved, their confidence in him was shaken, and columns were written about the situation in the Courier and Freeman. Lt. Col. Bingham eventually was court-martialled for conduct unbecoming and officer, and subsequently left the Army. The long-awaited orders finally arrived, only to be countermanded because of a serious outbreak of the measles at Camp Union. Orders came again on February 26, but the village was completely snowed in. Finally on February 27, the railroad tracks were cleared and the 92nd Regiment Excelsior Rifle Legion, left Potsdam, with Col. Sanford at its head. Colonel Sanford, despite his age, stayed in command of the Regiment until it reached the James River. Then ill health forced him, reluctantly, to resign his command, at the age of 72. He returned home and kept up his zeal and work for the cause until the end of the War, still speaking at all the big War rallies. He died on December 25, 1867. At one time, Col. Sanford had two sons and four grandsons in the Union Army. his son Henry B. was a 2nd Lieutenant with Company F of the 92nd Regiment. Henry was 45 years of age when he entered the Regiment, and remained with it for three years. Another son, Rollin O., was with Company L of the 7th New York heavy Artillery. Rollin died in Andersonville Prison, and is buried there. Col. Sanford's four grandsons in the Union Army were all sons of Henry B. Sanford. Henry T. Sanford took command of Company F, 26 Regiment; Erasmus Jonah Sanford was with Company F, 16th Regiment; Darwin E. Sanford was with Company F, 193rd Regiment, and Edwin D. Sanford was with Company E, 61st Regiment. "On Thursday last a committee consisting of Capts. Miller and Knowles was appointed to go and see Capt. Hunt and learn if possible from him if he would accept the Colonelcy of the 92nd were it offered to him. They succeeded in finding him in the 4th Regiment, Regular Infantry, near McClellan's headquarters. He pronounced himself as being very happy to receive the invitation and said that he was ready to accept the position at any moment that Gov. Morgan would authorize him: that he was very anxious to be in his father-in-law's [Gen. Casey] division, that he had before declined the Colonelcy of the 85th New York of our brigade because he expected to profit by a bill before Congress by which he would become chief-of-staff, but the bill failed to pass." "Immediately upon the reply being received a petition was drawn up to Gov. Morgan asking the appointment fo Capt. Hunt and it received the signature of every commissioned officer in the Regiment except one. Should our petition be granted and Capt. Hunt prove the right man in every respect, with his influence at headquarters the 92nd would be the 'bully' Regiment in Casey's division...I suppose by the time this reaches you, Col. Sanford will be nearer Potsdam than Yorktown. The man deserves much praise and credit."